In a previous post we spoke about the web-2-print sweetspot from the client’s perspective, but what about for the printer? Building web-2-print systems – microsites, templates etc is the operational reality for the printer. Whether or not you charge for the building of these systems (as discussed in this blog post), if web-2-print is to become a significant part of the business, then a significant number of templates will need to be built. If a template takes an extended period of time to make and is used a limited number of times by the client, then the effective cost per use becomes significant. For example, if we assume the employee who makes the templates costs £20 per hour, and the template is used a single time, then the likelihood is that this is a loss-making situation (Point A on graph). The easier it is to produce the templates, the fewer times they will have to be used by the client for the printer to generate a profit. This was the key driver for w3p. 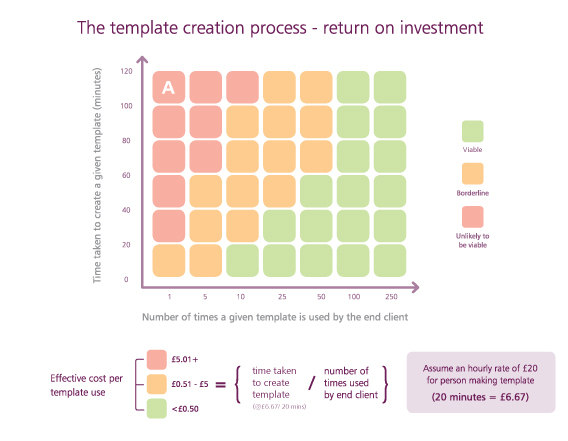 Simplifying the template creation process so that partners can build templates in 10 minutes. This makes building web-2-print systems more efficient, and reduces the number of times a template needs to be used to give the printer a payback. For more information about the template creation process please email info@w3p.com. Should I charge my client for web-2-print systems? The market for client web-2-print How does selling web-2-print differ from selling print?